4-27-14 Update on Ally’s spine surgery being CANCELLED, possibly permanently. HELP needed from other SMA Families, PLEASE! I know many of you have been wondering about Ally’s spine surgery scheduled April 17th and what happened. We were really shocked when we arrived at the hospital 8am on 4/16/14 to pre-admit Ally for surgery and were told it was postponed/cancelled. After the initial shock/confusion, I accepted that the orthopedic surgeon needed more time to research the pro-active nutrition plan we had requested and more. I understood that he wanted to meet with the medical team that would be caring for Ally before and after surgery. I want a surgeon to be confident, caring and prepared for any possible complication that could occur while operating on my daughter and also for her care before and after. So I waited for the medical team to meet and then we scheduled a date for Billy and I to discuss the outcome with the doctor. On Friday, April 25th, Billy and I met with the orthopedic surgeon in his office (without Ally). I’ve debated how to share what we were told in that meeting and IF I should share since it was a very emotional meeting, but I want family and friends to know what is going on with Ally’s journey and really our family’s journey with SMA. There is also going to be more discussions/research done regarding Ally, SMA, and spine surgery… so I don’t feel completely hopeless yet, but I am sad, upset, frustrated…. not even sure of the words to describe what I’m going through or Billy’s feelings since he is part of this journey too. I am not 100% who all attended the medical team meeting, but I know it included a person from the ethics department, the orthopedic surgeon, our pediatrician (who consulted with an SMA expert in Madison), and a few medical professionals from the PICU. Several people of the team have never or barely met Ally since we switched hospitals to where the orthopedic surgeon operates at. We were not invited since it was called quickly, but I hope to get minutes on the meeting and attend if there are any future meetings. At the meeting, it was decided by the team that Ally should NOT have spine surgery and the risks outweighed the benefits. It was felt that it would not improve her breathing (since she is already trached) and would not prolong her life. I have always said that I am focusing on Ally’s quality of life and we take it one day at a time with no guarantees with SMA. Ally’s spine is already curved into an S at around 70-90 degrees in each direction while sitting, and the top of her spine/neck curves forward. When supported by a brace, the curve still measures about the same degree. My opinion is, if Ally does not have surgery in the near future, the spine curve WILL make her breathing worse, impede more on her lungs, impede on her internal organs and will cause her a ton of pain. She will lose the ability to sit up in her powerchair (that she LOVES learning to drive by herself) and she won’t even be able to tolerate a slant in her other chair. She may become sooo twisted that she will need to be bedbound, in pain, and possibly even die a slow, painful death. Without surgery, her current quality of life will definitely diminish since the curve is already so great. I DO understand greatly that there are risks, big risks of surgery, but while Ally is here on earth, my job is to advocate for her happiness, health and quality of life. From what I understand, the team felt “Ally may be near the end of her life” and this is another reason the risks don’t outweigh the benefits. I’m not sure of the exact words and whom all agreed, but I am heart broken that a medical team feels this way. This is at a hospital that I felt did a wonderful job taking care of Ally for a week when she had a blood infection in Feb 2014 and where I think she can get great care at in the future. I believe the statement that “Ally may be near the end of her life” was made in a large part by looking at SMA statistics in outdated medical books. When diagnosed at 5.5 months old, medical books said Type 1 SMA kids have a life expectancy of less than 2 years old. Ally just turned 8 years old on February 2nd and I know MANY Type 1 SMA kids in their teens. There are young adults in their 20/30s, with variations of SMA, who were originally diagnosed with type 1. The care and knowledge (in many areas) is getting better and better for SMA kids and young adults and this is why they are living longer, happier and healthier. I know over 30 children who have had spine surgery (a large number who travel from around the country for surgery in Cincinnati and Madison). Chicago is still growing in their care of SMA and I know they will continue to grow. We only have IL state insurance for Ally, so I don’t have the option to go elsewhere, but we are still exploring that slim option. We also wanted to stay in the Chicago area since the hospitals are great, Billy can continue working, we could be with our other 2 daughters, and have support of nearby family and friends. Ally is trached, but overall she is healthy and is doing really well. After our severe winter, she is back to attending school daily and we are getting out doing lots of things as a family. None of Ally’s current doctors have stated to me that they felt Ally was declining and close to death. We got approvals from all the departments needed at the new hospital to have surgery. Ally does need higher ventilator settings because of her spinal curve and lung shape due to SMA, but I have HIGH hopes for a long future with Ally (happy and healthy, without pain). I am very thankful that the orthopedic surgeon will now reach out to the surgeons from Cincinnati, Madison and elsewhere. He is also going to reach out to Ally’s doctors from Lurie Children’s hospital who know her current medical status (although I need to make some new appointments with them since we haven’t seen most since early fall). HELP Needed from other SMA Families — Can you PLEASE share your spine experiences? Our orthopedic surgeon is very interested in learning more on SMA (and especially spine surgery for type 1/weaker kiddos since he has done spine surgery on type 2 SMA children). He will talk to other surgeons and asked me to share articles, research, and even stories/experiences from other SMA families. We plan to reconvene in one month to discuss possible surgery in IL or referral to go elsewhere (if we can find a way for a hospital to accept out of state public aide insurance). PLEASE, PLEASE, PLEASE, will you email me (tina@angelally.com) or facebook message me your child’s experiences? You can chose to exclude or include your child’s name. Please try to include type and severity of your child’s SMA, age of surgery, age now, degree of curve before and after surgery, type and number of surgeries, hospital, doctor (and maybe even doctor’s contact information), positive and negative experiences regarding surgery. How has spine surgery affected your child’s life? I really think this information can help many kids as hospitals and doctors expand on their care and options for SMA children. I will share it with our doctors and also in SMA support groups for other families on this journey making decisions about spine surgery. Please remember you can exclude or include your child/family name, but your input is SUPER important to help others. I GREATLY appreciate your time! If at all possible, I am going to try to collect these personal stories by May 10th or before. Thank you again for everyone’s support, prayers and/or help! I have not given up and will continue to find the best care options for Ally to give her a happy and healthy life. 4-16-14 Ally’s spine surgery postponed till ??? Just wanted to do a quick update to let everyone know that Ally’s surgery was postponed. I shared a couple of posts on facebook with family and friends, but here are a couple of updates if you are not “friends” with me on facebook. Wednesday 1pm — Surgery officially postponed till ??? — Thank you everyone for your thoughts and prayers. We are home and semi-unpacking. I understand the doctor wanting to be extra cautious, but just wish there had been better communication as I am beyond mentally drained. We definitely prefer a doctor to be cautious, prepared, confident….and we are happy with the surgeon and hospital we chose. But, I wish we would have known sooner that there was any chance of postponing or that it was overall cancelled last night, and not gone to the hospital today with ALL of Ally’s and my stuff. Everything DOES happen for a reason and in time it will happen. I should be talking to the surgeon later today with more answers and maybe get a timeframe of when and if it will all happen. Then I will begin to prepare again. For now, I might need to find a Groupon massage, watch some trash tv, pray, sleep… since I don’t really drink. Almost two weeks ago, the surgeon became concerned when I asked for Ally to be admitted the day before to begin TPN (special IV nutrition) since SMA kids should not go more than 4 hours without their regular feeds or TPN due to an overall fatty acid metabolism issue. I explained that Ally has not officially been diagnosed with this, but it is a pro-active precaution taken by SMA treating hospitals (that do SMA spine surgeries often – specifically Madison and Cincinnati and others). Since he was out of the country, I gathered some information on this, and then our pediatrician followed through with talking with Dr. Schroth and Madison’s pharmacy, and then she helped relay this information to our PICU director and anethesia. Everything seemed ALL set and they were going to follow using TPN before, during and after surgery. I got 3 calls to admit her directly to the PICU at 8 am today (day before surgery since TPN has to be ordered by noon). The PICU team felt comfortable with this universal precaution, but the surgeon needs more time to research it and discuss it with the team since he is worried if the “fatty acid metabolism issue” could cause any complications. The surgeon and his nurse planned to call me and postpone surgery this morning, but they didn’t know we were already in the admitting office. I hope it will all still come together for the near future and I’m staying hopeful, but it is an extra stress. I DO want the surgeon to feel safe and confident though. I don’t think there are any other concerns, but just that he wanted more information himself and needed to sit down as a team with the PICU team to discuss all this. It didn’t happen yet since he returned from a mission to Bulgaria on Sunday, but I was given no warning of possible cancellation until we arrived. In fact, I was given every sign that the TPN/Nutrtion was all worked out. The surgeon is the one who has to feel safe and is liable, so I understand overall and will wait to hear from him. Sorry for my ramble, but it will maybe help make sense of this complication. Wednesday around 9am — Arrived at the hospital at 8:15, but as of now we are told surgery is canceled/postponed due to sorting through more nutrition stuff that I was told was settled/planned with our pediatrician/consultation with Madison/SMA experts and the picu team, but Dr. Mardjetko wants to do more research and sounds like he is now not available for surgery tomorrow although we were called by 3 people to come this morning and planned the next two weeks+ around this. Waiting at hospital to talk to some of the PICU team in person to understand the problem more. Tuesday around midnight — Packing for Ally’s (and my) BIG stay at Lutheran General Hospital for her spine surgery (on Thursday) and then recovery. She will be admitted TOMORROW morning at 8am so that they can re-do a few labs and order TPN (which is a special IV nutrition that will begin 6 hours before surgery, during and for awhile after). SMA kiddos should never go more than 4 hours without food or TPN. Praying for a smooth morning as it will not be easy getting there at 8am (but I will have help from one of our home nurses, Anna). Also praying for great teamwork and smooth transition as the hospital team gets to know Ally better and we get to know them. She spent 5 days at LGH in February but it is still new to us. I’m getting more and more nervous about Ally’s spine surgery, but know it is absolutely needed to keep her as healthy, happy, pain-free, and active as possible. It is a positive thing, but still very risky and scary. Recovery will be about 2 weeks in the hospital and around 6 weeks before school again. I will update when I know more, but have come to terms that it is best to be 100% prepared and that surgery will happen when it is right and under the best conditions. These are a couple of posts I recently shared on facebook. I’ll update more soon, but Ally’s surgery date being scheduled is HUGE!!! Also wondering if anyone wants to join us last minute for the MDA Muscle Walk or make a last minute donation? 1) WOW!! Just got the call, Ally’s spine surgery will be on April 17th with her 95% being admitted on Wednesday, April 16th. This will straighten her spine to keep it from collapsing on her lungs and internal organs, and help her stay comfortable sitting up. It is to preserve her quality/happiness of life (which is different than you and I, but still a happy life) This is a POSITIVE, yet scary surgery for her and our family. It will be a full spine fusion or may also involve a luque trolley to allow growth. We are not going to address her neck/cervical kyphosis/curving in this surgery, but will watch it carefully. We have some pre-surgery things to do (most finished on Thursday 4-3-14) and then she will be in the hospital for about 2 or more weeks after surgery. We will be in the hospital for Easter and Melissa’s 10th Birthday, so may need a little extra support from family and friends, but again, this is a positive step for Ally. 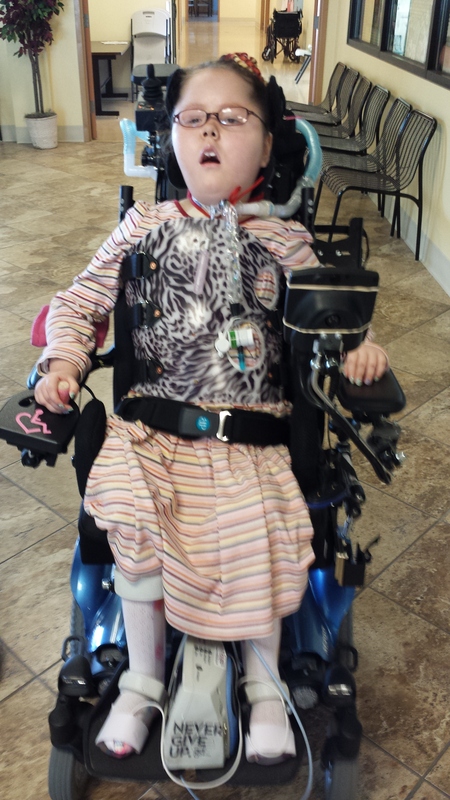 Recovery will be about 6 weeks and she may be out of school for that entire time, but will receive homebound instruction and then be ready for summer school and summer FUN, especially driving her powerchair comfortably. Thanks in advance for everyone’s support and prayers!!!! 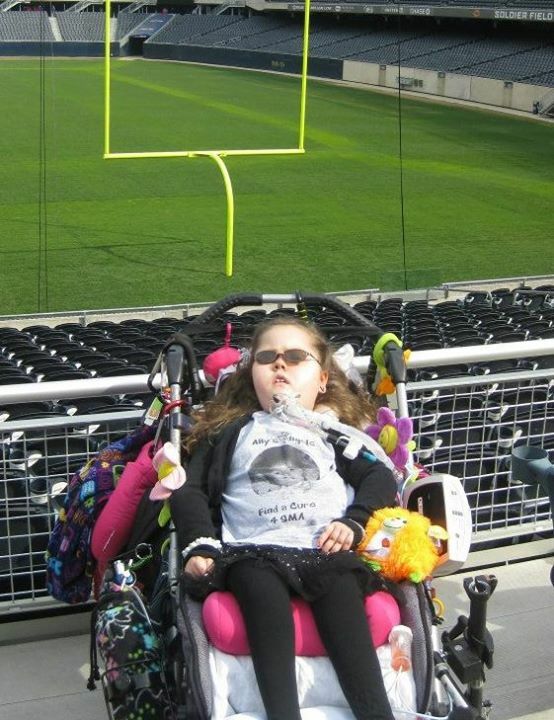 Please consider donating $10, as it really does make a difference, gives us hope, and we LOVE seeing those that are thinking of/supporting my daughter Ally who has Spinal Muscular Atrophy and continues to beat the odds daily. You can also decide to join us for a FUN morning at Soldier Field this Saturday, April 5th. Soooo glad to have the Shofner Family who JUST joined our team! Also Meghan Ortega, Tina Chiang, Mark Capodagli, Tammy Maruszczak Cecchini,John Cecchini, Jacob Ortiz, Kristyn Krajewski, some of Lane Tech Cheer Team… who will be with us!